Note: This article is the 4th in a series of posts about electronics. Once you have acquired the hardware: a breadboard, a programmer, a serial adapter, some wires, and a microcontroller, you’re ready to make it tick. For most future entries, if you’re following along, I will assume that you’re using an AVR Dragon, a Sparkfun FT232RL breakout, and an Atmel ATmega644PA in PDIP package. I personally have been using the Eclipse IDE for most of my AVR work. Eclipse has excellent C language support, and a pretty logical workflow. Its configuration can be a bit painful sometimes, but overall it works very well for AVR development. You’ll want to install at least the AVR Eclipse Plugin and support for your favorite source control (I use the SVN support). Target — The target system is the one the code is being written for. It’s usually not capable of doing the compiling itself because it’s either too new (the tools haven’t been ported), unsupported directly by the tools for one reason or another (a common reason is that it doesn’t have enough RAM), or is primitive enough that it could never actually run the compiler itself in the first place (microcontrollers especially). Support for cross-compiling for AVR has been in main-line GCC for quite some time now, so it is available in a lot of different places. When GCC is built to cross-compile for AVR it is usually (but not always) named avr-gcc, and many Linux distributions—such as Fedora 12—have packages pre-built for it. In addition to a C compiler, you will need a C library. The avr-libc project provides a version of libc suitable for the AVR, with much of the libc stuff you’re used to (a type library, malloc, strcpy, etc. 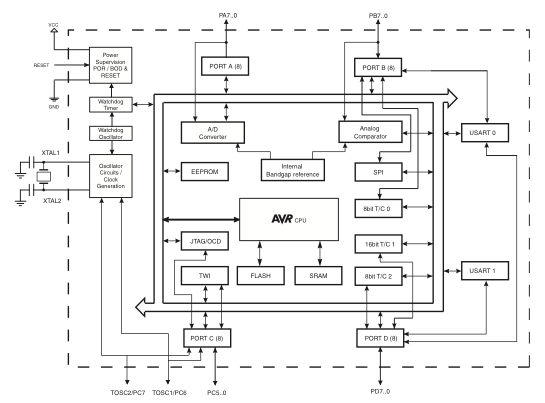 ), and a bunch of AVR-specific things (delay subroutines, defines for all kinds of microcontrollers, etc.). Again, on many Linux libc is quite easily provided by by the pre-built packages. You must always define which exact model of microcontroller your code is “targeted” at using -mmcu=atmega644pa for instance, for the ATmega644PA. It’s not strictly required, but is generally a good idea to tell the compiler (and thus your code) what frequency you expect the microcontroller to be running at using the F_CPU define; generally it’s best to define this on the gcc command line (rather than using #define) with -DF_CPU=8000000L for 8 MHz, as an example. If you don’t define F_CPU, you can’t use the delay functions (_delay_ms and _delay_us) and some others. There are substantive differences besides mere performance when running with optimizations off and on. For instance, the delay functions mentioned above require optimization to be enabled to work properly. Generally you should compile with -Os for optimization based on code size. You need to carefully watch the resultant code size with each compile. The AVR Eclipse plugin automatically runs avr-size with each compile to keep you apprised of the current code size, but if you’re writing your own makefiles you will want to do something like avr-size --format=avr --mcu=atmega644 foo.elf. Once you have a working development environment and you’re able to compile code, you will need a program to transfer that compiled code to the microcontroller. The avrdude program does just that. There is built-in support for it from the AVR Eclipse plugin, which simplifies things a lot, but you can also use it from the command-line. You will almost certainly want minicom, a serial terminal emulator, to communicate with the microcontroller over the serial port. On Mac OS X, of course Apple doesn’t provide any pre-built packages for all of this, but Eclipse is readily available for Mac OS X, and the rest can be provided simply by CrossPack for AVR Development, which bundles avr-gcc, avr-libc, and avrdude into a nice pkg installer. You can get minicom through either Fink or MacPorts. Note: This article is the 2nd in a series of posts about electronics. In my previous post I mentioned that I identified microcontrollers and microcontroller programming as one of the key disciplines that I needed to study up on. I have been programming in one way or another for about 20 years now, so I have done so on a pretty wide range of computers, but aside from some tinkering with a PIC microcontroller, I never really did anything with these amazing and tiny computers. 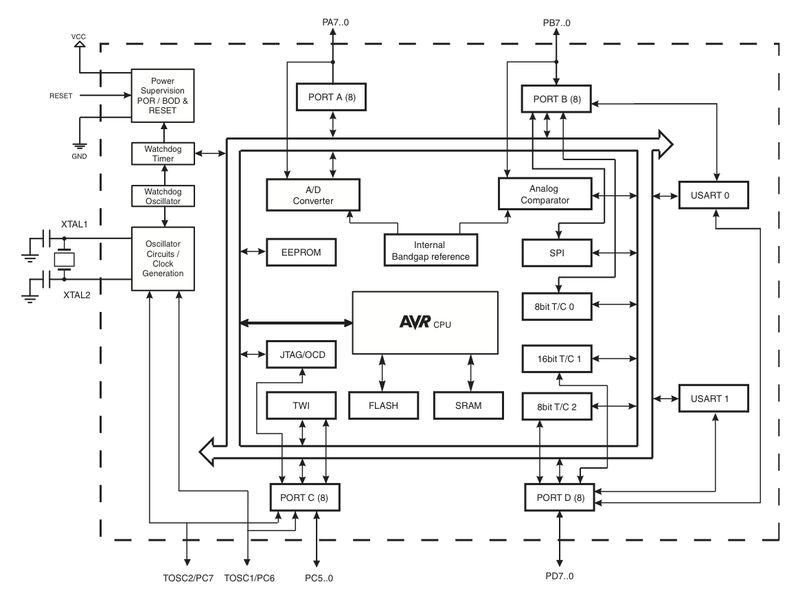 This post will take a look at the hardware side of the microcontroller picture. A microcontroller is, more or less, a very tiny and (often) self-contained computer. While compared to the past, modern microcontrollers are extremely advanced, run at very high speeds, and have huge amounts of program storage and RAM, compared to modern PCs, they seem incredibly primitive. Size — If you’re looking to build something small, you can still give it a lot of brain power with a modern microcontroller, and it will fit in the palm of your hand. Power consumption — The power consumption of microcontrollers is usually measured in micro-amps (ÂµA). PCs, even very simple ones, can’t even come close, especially once you make use of some of the power saving features on the microcontroller. Durability — Vibration, heat, dust, etc. aren’t really a big problem for most microcontrollers. 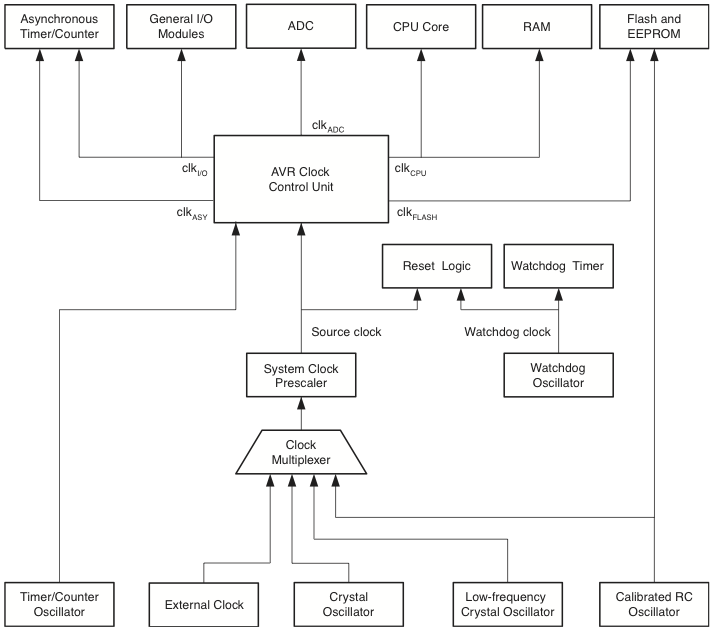 The sheer number of internal peripherals such as timers, serial interfaces (UART [TTL serial], I2C, SPI, and even USB), analog-to-digital converters (ADCs), pulse-width modulation (PWM), and of course tons of general purpose IO (GPIO) pins. Many of these peripherals can even be used in interrupt-driven background modes, making more processor cycles available to your main program. Speed — While 20MHz (or less!) might not seem like much to us desensitized by modern multi-GHz PCs, when you don’t have the overhead of 12 layers of operating system, and when your tasks are very simple, a few MHz is more than enough; it will be far more responsive than a PC ever could be. Price — Atmel AVR microcontrollers run from less than a dollar up to a few tens of dollars each depending on capacities and features. Most of the ones I use are around $8. When I was first looking at trying my hand at microcontroller programming, I more or less chose the Atmel AVR series by accident: some sites that I respected (like Sparkfun) had many projects based on it, and I noticed the avr-gcc (merged into gcc proper) and avr-libc projects seemed to be very well maintained. I knew about the Arduino platform (which is based on the Atmel ATmega328), but I really wanted to get into the internals of everything, and I already know C and low-level systems programming pretty well, so I figured it would be easy. I believe, especially now, that I made the right choice. The Atmel AVR ATmega and ATtiny series’ of microcontrollers are 8-bit RISC architecture processors combined with a variable amount of erasable flash memory for program storage, static RAM (SRAM) memory for working data, non-volatile EEPROM memory for persistent data, and a bunch of peripherals, but usually a couple of timers, a UART, a few ADCs, and a few PWMs, an I2C bus, an SPI bus, and some GPIOs. They are typically programmed over their SPI bus, and can even be reprogrammed in-circuit. All of that for just a few dollars each. I decided to do most of my microcontroller work on the Atmel ATmega644 (including ATmega644P and ATmega644PA revisions). It has enough flash that I don’t need to worry about running out of space (except by accident, heh) and enough SRAM that most anything I want to do is possible. While it’s kind of chunky in PDIP package, it’s certainly petite enough for my needs in TQFP and QFN packages. Breadboard — These are pretty standard, but you’ll want a few good ones so you don’t have to unplug everything to try something new or test something. USB serial adapter — Sparkfun sells several based on the FTDI FT232RL serial interface chip (5V and 3.3V), and they work very very well on all operating systems. Crimped jumper wires — These are awesome for making quick and easy connections between boards, for making custom programming cables, etc. I use a ton of them. You will want M-M, M-F, and F-F, and a good selection of crimp connector housings; I find the most useful ones are 1×1 (jumpering), 1×2 (power etc. ), 1×3 (I2C, serial, etc), 1×4, 1×6 (ICSP), and 2×3 (ICSP). Pre-cut jumper wires — These are critical for making short connections on the breadboard. Pololu has a good selection of them. Atmel ATmega644PA PDIP 40 — Good for all sorts of hackery, but quite big in PDIP package. Currently $7.50 each individually. Atmel ATmega168 or ATmega328 — These are cheaper, smaller, and less capable. They are great once you’ve written something and want to deploy it at a larger scale for cheaper. They are also great if you want to use the Arduino bootloader. Atmel is having all kinds of supply issues with them right now (welcome to the world of hardware! ), so good luck finding them. My desk during prototyping. 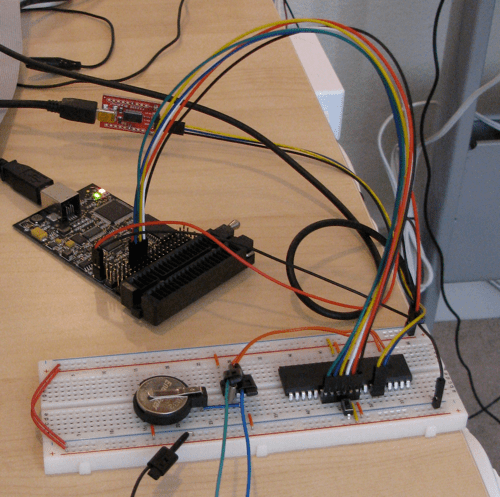 A breadboard with ATmega644PA, the AVR Dragon, and a Sparkfun FT232 breakout. While it may seem incredibly boring, you will learn a lot by reading the datasheets for the parts you’re buying. After having worked in the software industry for 12 years, I am very impressed by the sheer level of accurate documentation in the hardware world. It will save you a lot of time if you at least skim the datasheet for every part you intend to use before you break it out (or even before you buy it). You will probably want to choose whether you want to work at 5V or 3.3V. The electronics world is currently fractured between those two voltages pretty evenly (as well as some lower voltages such as 1.8V). Many things are not compatible between the two, so always check the voltage very carefully before you buy something. You do not want to be working out level conversion issues while you’re just trying to learn and get things working. It doesn’t matter which you choose (although arguably more hobbyist stuff is 5V) but everything you buy should be the same voltage unless you have a large budget. I’ll get into how fuses (basically, non-volatile configuration switches) work in a later blog entry, but suffice it to say, if you see stuff about fuses and setting them, be extremely careful. If you set the fuses incorrectly you can easily get your AVR into a state where it can’t be serially programmed and you’ll need to trash it or rescue it with parallel programming. (See above about why AVR Dragon with a ZIF socket is nice.) I have done this a few times, and it’s not fun to fix them, but at least it’s possible with my setup.